A new book titled “How [Not] To Write Great Lyrics! – 40 Common Mistakes To Avoid When Writing Lyrics For Your Songs” aims to help aspiring songwriters steer clear of the many traps they can easily fall into when writing lyrics for their songs. Written by experienced music publisher and music consultant Brian Oliver, the book takes a close look at the essential lyrical elements that are consistently found in the structure of all hit songs. It highlights the most common errors that are made when these key components are built into a song, and shows writers who are just starting out how to avoid such mistakes in their own lyrics. This new book is the follow-up to Brian Oliver’s five-star rated title: “How [Not] To Write A Hit Song! 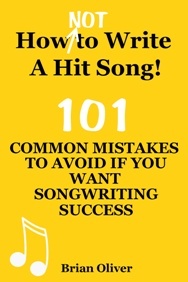 – 101 Common Mistakes To Avoid If You Want Songwriting Success”. Written in an easy, non-technical style, “How [Not] To Write Great Lyrics!” identifies many frequent causes of lyrical shortcomings—from common mistakes in the basic construction of song lyrics … to making flawed choices with titles, opening lines, lyrical hooks, verb selection, rhyming patterns, and more. The book also highlights other causes of lyric writing problems—such as having the wrong mental attitude, not paying enough attention to ‘creative preparation’, and not taking steps to avoid writer’s block. “How [Not] To Write Great Lyrics!” includes important tips on fixing and strengthening lyrics, along with a comprehensive checklist of more than 100 potential hazards that writers can measure their own lyrics against—no matter how ‘finished’ they think their songs are. Most songwriters have, at some stage, had to endure the disappointment of having their songs rejected and ended up asking: “Could I have done more to make my songs better?”. This book aims to help writers recognise weaknesses in their lyrics, so that they can re-work them, make them stronger, and hopefully achieve the breakthrough they’re striving for. The book’s author Brian Oliver—who has worked with legendary songwriters such as Neil Diamond, Janis Ian, Albert Hammond and Gilbert O’Sullivan—warns that aspiring writers’ chances of success could be hampered if they fail to spend enough time polishing and editing their lyrics and eradicating weaknesses. Says Oliver: “When a new lyric idea suddenly hits you – and everything comes together so quickly that the song almost writes itself – it’s very easy to fall into the trap of rushing straight into a studio and recording a demo. You then confidently submit the song to a music company believing it’s the best thing you’ve ever written – only to suffer the agony of having the song rejected. “How [Not] To Write Great Lyrics! – 40 Common Mistakes To Avoid When Writing Lyrics For Your Songs” is now available from Amazon, Barnes & Noble and other good book stores as a paperback, or as an eBook from Amazon’s Kindle Store, Apple’s iTunes Book Store, Barnes & Noble’s Nook store, and Kobo Books.